A complete water top up system thats fully automatic. As part of any filter cleaning process, most filter systems discard a small amount of pond water during each cleaning cycle. Although it is very easy and highly recommended that you top up your pond regularly, the Proficlear Guard can do it automatically. The system has 3 parts, the water level sensor, the solenoid valve and the weatherproof control box. 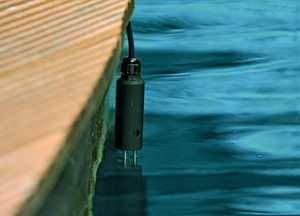 The ProfiClear Guard sensor is positioned so that the probes are in the pond water when the pond is at it normal level, when the water level drop through removal or through evaporation, the sensor sends a signal to the control box. The solenoid should be fitted in to a mains water feed to the pond so that when signalled, it can open and allow main water to fill the pound until it reaches it's original level. Oase ProfiClear Guard - Automatic Pond Top Up System can also save you money. Normally most pond keepers tend to do larger top ups and as a result, it is wise to use a dechlorinator. However as the Proficlear Guard tops up small amounts frequently, the chlorine will be diluted to a safe level and disperse naturally, avoiding the costs of dechlorinator.